How do I get rid of a huge whatsapp backup that just won't delete? There's a WhatsApp backup on my Windows 10 mobile's memory card that won't go away and it's taking up over 6GB of storage space. I've tried many times to delete the folder and the sub folders + files individually through File Explorer on my phone and on a PC, I've reinstalled the app several times fiddling around each time (trying to get a brand new backup, not restoring backup, etc) and I've soft reset my phone a couple times (tried re-inserting my memory card). 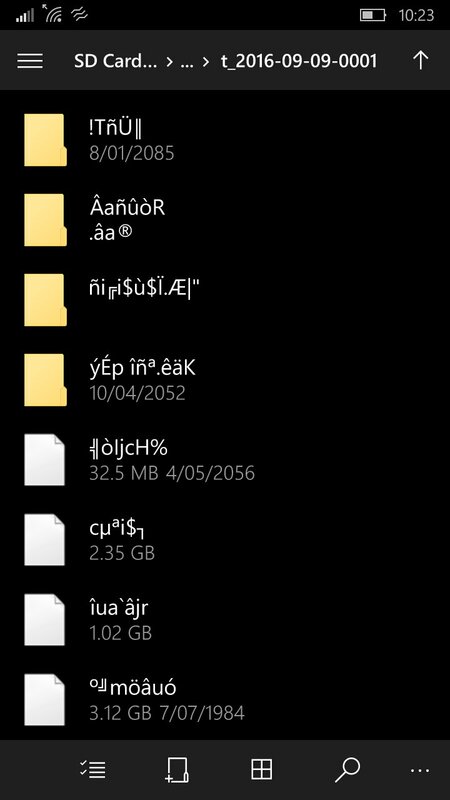 Nothing works and the sub folders and files appear to be non-readable with strange names and dates. Should I do a factory reset, get a new memory card or is there some other way around this? Edit: My phone isn't interop unlocked and I would prefer not to do that. Eject Micro SD card from phone. Move all items as they are onto the laptop, but omit the WhatsApp backup folder items you want to get rid of. Move back the data you want, and double check if you have gotten rid of the files. Also, it would be wise to format the card for the second time in your phone before copying back the data onto it. I just did it as an extra precaution so as to avoid filesystem errors. Not the answer you're looking for? Browse other questions tagged windows-10-mobile whatsapp backup or ask your own question. How to extract whatsapp messages.db message backup? SMS Backup : where are sms that I've sent?